Box Text: IN DARKNESS, FIGHT WITH LIGHT. When the wife of best-selling writer Alan Wake disappears on their vacation, his search turns up pages from a thriller he doesn't even remember writing. A dark presence stalks the small town of Bright Falls, pushing Wake to the brink of sanity in his fight to unravel the mystery and save the woman he loves. 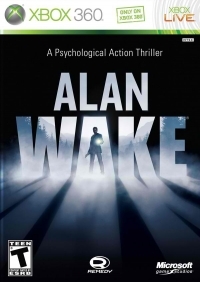 Part action game, part psycological thriller, Alan Wake is a pulse-pounding thrill ride. From Remedy, the masters of cinematic action, comes a psycological thriller filled with intense action and unforgettable cinematic moments. Storytelling at its best, Alan Wake is like a tightly paced thriller TV series, offering endless twists and cliffhangers, and building up to an epic conclusion. Light is your greatest ally and your only protection as darkness takes over everything and everyone, and turns them against you. 07-26-2013 matt Description Fill the shoes of one Alan Wake, a man who makes his living from the terror of others as a best-selling suspense novelist. Trapped in the deceptively peaceful Washington town of Bright Falls, where he came to escape the trauma of losing his fiance, Alan must piece together a mystery to prevent himself from being trapped inside a nightmarish world forever. An intense psychological thriller from Remedy, the creators of Max Payne, Alan Wake looks to raise the bar for future games, creating a true cinematic experience. Explore an expansive world filled with missions, unique puzzles, intense combat, and horrifying enemies. Dig into a twisting and multi-layered story filled with suspense, engaging characters, and shocking revelations. 07-26-2013 matt Box Text IN DARKNESS, FIGHT WITH LIGHT. When the wife of best-selling writer Alan Wake disappears on their vacation, his search turns up pages from a thriller he doesn't even remember writing. A dark presence stalks the small town of Bright Falls, pushing Wake to the brink of sanity in his fight to unravel the mystery and save the woman he loves. 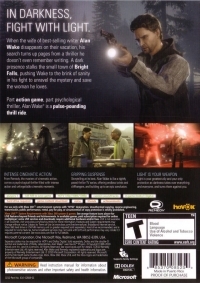 Part action game, part psycological thriller, Alan Wake is a pulse-pounding thrill ride. INTENSE CINEMATIC ACTION From Remedy, the masters of cinematic action, comes a psycological thriller filled with intense action and unforgettable cinematic moments. GRIPPING SUSPENSE Storytelling at its best, Alan Wake is like a tightly paced thriller TV series, offering endless twists and cliffhangers, and building up to an epic conclusion. LIGHT IS YOUR WEAPON Light is your greatest ally and your only protection as darkness takes over everything and everyone, and turns them against you. 05-04-2013 artikskarab Description Fill the shoes of one Alan Wake, a man who makes his living from the terror of others as a best-selling suspense novelist. Trapped in the deceptively peaceful Washington town of Bright Falls, where he came to escape the trauma of losing his fiancï¿½e, Alan must piece together a mystery to prevent himself from being trapped inside a nightmarish world forever. An intense psychological thriller from Remedy, the creators of Max Payne, Alan Wake looks to raise the bar for future games, creating a true cinematic experience. Explore an expansive world filled with missions, unique puzzles, intense combat, and horrifying enemies. Dig into a twisting and multi-layered story filled with suspense, engaging characters, and shocking revelations. 04-10-2013 artikskarab Box Text IN DARKNESS, FIGHT WITH LIGHT. When the wife of best-selling writer Alan Wake disappears on their vacation, his search turns up pages from a thriller he doesn't even remember writing. A dark presence stalks the small town of Bright Falls, pushing Wake to the brink of sanity in his fight to unravel the mystery and save the woman he loves. Part action game, part psycological thriller, Alan Wake is a pulse-pounding thrill ride. INTENSE CINEMATIC ACTION From Remedy, the masters of cinematic action, comes a psycological thriller filled with intense action and unforgettable cinematic moments. 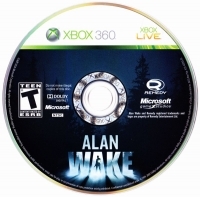 GRIPPING SUSPENSE Storytelling at its best, Alan Wake is like a tightly paced thriller TV series, offering endless twists and cliffhangers, and building up to an epic conclusion. LIGHT IS YOUR WEAPON Light is your greatest ally and your only protection as darkness takes over everything and everyone, and turns them against you.